Our roots being with the North Andaman Tsunami Relief group of volunteers and their work in the wake of the Indian Ocean Tsunami in 2004. Founder Bodhi Garrett had made a home for himself along the North Andaman Coast in Thailand before that fateful December day. He started NATR to help the local communities recover from a natural disaster, without knowing where it could lead. Andaman Discoveries was founded in 2007 to continue to work of NATR and became an award winning community based tour provider that continues to work with those same affected communities and many more. In 2014 the North Andaman Network (NAN) Foundation, was launched by Andaman Discoveries to help focus on the Community Based Development projects in communities along the North Andaman Coast. In cooperation with the North Andaman Community Tourism Network, Andaman Discoveries and NAN seek to support these communities in creating and implementing sustainable projects that help to develop their ability to adapt to changing environments. Below you can read from a list of our projects from 2007 by category. The Moken are an ancient sea people who have travelled among the islands of Thailand’s North Andaman coast for thousands of years. Traditionally nomadic, they would spend most of their time out at sea in their boat houses and moored in sheltered locations during the monsoon season. In recent years, the Moken have responded to growing socio-economic pressures by settling permanently in Ao Bon Bay. They have come to rely on selling handicrafts as an important source of income, but often have trouble communicating with visitors who wish to buy their woven baskets and hand-carved model boats. 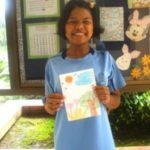 To help with this, Andaman Discoveries partnered with a local health worker to provide English lessons to the children of Koh Surin – we provided books, pencils, lesson plans, and a whiteboard. Andaman Discoveries is also sponsoring a “clean household” competition to encourage Moken to address the litter generated by goods from the mainland. “Mustafa” is a member of the Andaman Discoveries family, having worked closely with us on community education and guide training for the tourism groups. In late 2008, Mustafa had a stroke that left half his body paralyzed. Having dedicated his life to low-paid jobs in community development, Mustafa had no way of making money while he recovered, and no savings to help him pay for food, accommodation, and medical expenses. With the generous help of former volunteers and Mustafa’s friends, Andaman Discoveries covered Mustafa’s expenses for several months while he recovered from the stroke. His course of treatment within the Thai medical system has been covered by the government, but he had no means to pay for his physical therapy and transportation to and from the hospital. The doctor also recommended acupuncture, which is a widely recognized effective aid in stroke recovery. Mustafa has responded well to acupuncture, showing significant progress after each of his sessions. The acupuncturist also helped Mustafa to give up smoking and drinking, and to adopt a healthier lifestyle. Mustafa is now teaching “English for Tourism” to locals in nearby Khao Lak and working once again as a guide. “Travorn Prikunvat” – In April 2008, Andaman Discoveries provided funding for the throat surgery of Travorn Prikunvat, the mother of our former handicraft coordinator, Su Andankan. Su had been part of the North Andaman Tsunami Relief/Andaman Discoveries family since 2005. Mrs Travorn was diagnosed with throat cancer and required treatment immediately. She has fully recovered. Andaman Discoveries doesn’t usually support the donation of food or clothing, as we would rather address the socio-economic circumstances that create that need. However, after an urgent request for assistance by Narimon Arunonpai, a respected social researcher from Chulalongkorn University, meant we had to take action. The Moken community on Koh Surin National Park was in need of rice and basic cooking necessities as bad weather had prevented them from fishing in October 2007. Many of the villagers were growing weak and becoming ill. The community had come to the mainland for their Tenth Month Ancestor celebrations and each family received a 10-kilogram bag of rice, fish sauce, dried chilies, and other ingredients to keep them going until the following month when they would be able to commence fishing again. Computers, Health, and High School Diplomas – A health fair and first aid training was held in Ban Talae Nok in May 2009, with support from YouthLINC. The volunteers provided hands-on training on emergency medical care. Other topics included: dental care, hygiene issues, and family planning. Many adults in the region lack a formal education, with many leaving school early to assist their parents. As a result many are illiterate and do not have a high school diploma which makes it difficult to gain formal employment. Free informal education classes have been set up at the community centre of Ban Talae Nok. Andaman Discoveries donated the books to the villagers in early 2008. Since then, 15 persons have obtained their high school diploma, and the number of graduates continues to grow as the books continue to be passed onto others. A volunteer provided a month long computer training for 20 participants in Ban Talae Nok village in early 2008. Topics included: computer basics such as how to turn on a computer, and using software applications such as Microsoft Word and Excel. The majority of the students graduated from the program. The Ban Talae Nok Community Centre was built using funds and volunteers from Andaman Discoveries (then North Andaman Tsunami Relief), shortly after the tsunami, primarily as a coordination and distribution facility for aid. It was crucial to the well-functioning of the community in the chaotic time after the tsunami. During that time, villager-based committees were formed through various focus groups, including livelihood restoration, eco-tourism and environment, community development, and education/vocational training. The Community Center at Ban Talae Nok was central to village life. The center provided myriad services — vocational training, informal education, an information center, aerobics space, a community-based tourism office, children’s activity space, a handicraft production facility, a souvenir shop for local products, and a meeting space. Activities in the center included English lessons, summer camp for kids, and a waste management project. Currently, the community center is home to the soap cooperative and the youth group, who use the center as a production space and as a location to conduct meetings and activities, respectively. The village has secured funding to refurbish a building in the village to serve as a permanent community center and thus ensure the continuation of this vital resource. Andaman Discoveries administers long-term scholarships to a total of 135 students, providing financial support for primary and secondary school education for a total of seven years (2005-2011). Our criteria for acceptance into the program includes: financial need, tsunami-affected status, motivation of the applicant, academic performance, community service, and the opinion of our village contacts. Almost 300 children initially applied to the program. The cost of sending children to school has always been a challenge for needy families, and the loss of income after the tsunami made this an even greater challenge. The earning capacity of many families was halved, and some remain without sufficient income. Despite these obstacles, families place a high value in education as a means for opportunity. Our staff regularly monitors the sponsored students through a mandatory yearly interview with the child and parents. We receive an update on the child’s well-being, academic performance, and community service activities. Upon satisfactory completion of the interview, we then transfer funds for uniforms and school supplies. Each year, children are required to send a copy of their grades and proof of registration for the next school year. Sponsors are provided with regular updates on their child’s performance, including a hand-written letter from the child. We have partnered with several organizations in order to ensure the long-term viability of the program, and are grateful to these sponsors for providing a full seven years of funding. Sponsors include Annika Linden Foundation, Tanglin Trust, Helen Doron Group, Rotary Club of Koh Samui, Tomas & Thisbe Ander Memorial Fund, Whatever Pte. 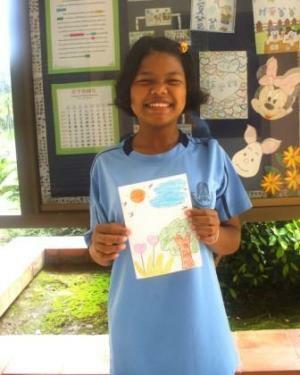 Ltd.
Andaman Discoveries would like to expand the program to include even more deserving children. Every year from 2006 to 2010, Andaman Discoveries has joined hundreds of community members for the annual Children’s Day celebrations at Tung Dap and Ban Talae Nok villages. In Tung Dap, we sponsored popsicles and drinks for over 50 children that gathered to dance in a specially adorned sala while guests and friends cheered them on. We also enjoyed a brief walk down to the beach, where you could see the devastation of the tsunami, even now, after six years. The coast was beautiful, as were the smiling faces that welcomed us into the community. We left feeling full and sun-baked after a revitalizing trip to one of the villages we hold dear. On December 27th, 2009, as we have for the last five years, we celebrated an afternoon filled with innocent laughter and fun with the villagers of ban Talae Nok. Adults gathered to watch as children played games, sang songs, participated in an eco-quiz, and received gifts courtesy of Andaman Discoveries. December 26th marked the five-year anniversary of the tsunami, the catastrophic event that brought the Andaman Discoveries global family together on this mission of compassion. We’re constantly amazed by the degree to which the villagers of the North Andaman have recovered since that life-altering event. 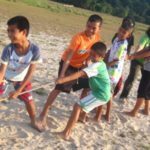 Despite 47 fatalities — eight of whom were children — and the physical loss of half their village to the wave, the people of Ban Talae Nok have worked diligently to create a better future for their children. Today, the village is an award-winning model of sustainable development with a highly engaged youth group and a successful responsible tourism program. Andaman Discoveries donated gym equipments to a local Thai boxing gym in Kuraburi town in 2007 to support the gym owner’s idea of providing free classes to youths in the area. “Young people get bored easily and this can lead them into trouble,” explained Ajarn Mon. “This training centre allows them to focus on something and keep them fit at the same time.” Visitors can join morning and afternoon training sessions to learn about this much respected ancient sport. Over 200 books were donated to the library located in the Ban Talae Nok community centre in 2007 by Andaman Discoveries. The library was opened to all villagers. It has been closed since the beginning of 2009, but will soon be reopened again. 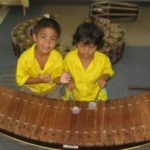 Ban Talae Nok School received a donation of Thai traditional instruments that have been locked up in the music room for months, as no one in the village could provide proper training on them. 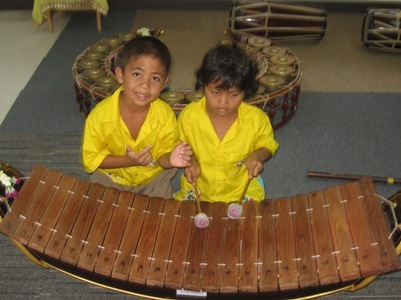 Andaman Discoveries hired a traditional music teacher to teach the children in the school for three months in late-2007 and early-2008 to learn about the basics. The students performed in front of Her Royal Highness Princess Maha Chakri Sirindhorn, at the official opening of the Ban Talae Nok School in May 2008. The children continue to play the instruments since then. Westerners are a rare sight in this region and both guides and villagers do not have the confidence or the English ability to have long detailed conversations. Many villagers have a basic level of English but they are often shy to speak and don’t say much. 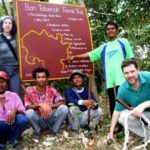 In the early years of community-based tourism development, our volunteers encouraged them to practice as much as they could, whether they were hiking on the nature trail or having a meal at the homestay. In the past, our volunteers have developed several teaching materials for teaching in the school and at the homestay. A Thai/English phrasebook for both the visitors and the villagers were also developed. The phrasebook is always provided to every guest before they head to the village. Youth in Action for the Next Generations is a global project based on the active involvement of around 50 youngsters from different backgrounds to provide education for sustainable development. This one-year project involves youth from Italy, Indonesia, Austria, Senegal, Thailand, India, France, and Hungary to allow young people to initiate the strong innovating local projects with an international dimension. Organized by Pistes Solidaires, a French non-profit organization that promotes justice and equality in an intercultural society and an interdependent world, the project now has a web site database with all participating projects. 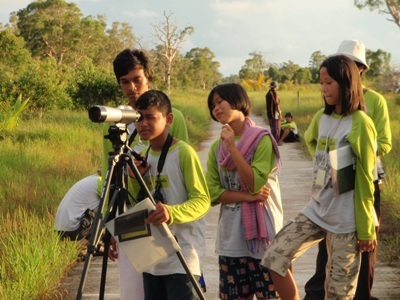 In Thailand, Andaman Discoveries collaborated with Mangrove Action Project, and the International Union for Conservation of Nature, to create a network of ten youth groups in the North Andaman region. Participants shared experiences and ideas on conservation, waste management, organic gardening, income-generating projects (such as making batik, cloth bags, and recycled-paper cards). A local seminar was held in October 2009 where youth presented their ideas and experiences. Andaman Discoveries hosted the final meeting in November 2009, which summarized the various outcomes and was attended by NGOs from the eight participating countries. Youth ACT project focused on a “Local Action, Global Change” philosophy and promoted youth understanding of the interconnections between society and the environment, and how each person can make a difference through collective action. The six-month projects took place in 2007, which was funded and administered by Andaman Discoveries. This idea came up as many tsunami affected youth recognized the importance that a healthy environment played in mitigating the effects of the killer wave, as well as the importance of the environment to the local way of life. But there has been no environmental education in local schools, and even less opportunity for youth to be actively engaged in protecting the environment. The youths participated in interactive activities roughly every two weeks. Learning took place in the field and in the classroom, and guest teachers included park rangers, conservationists, and educators. Throughout the course, we ensured that leadership and conservation skills were developed to the fullest. 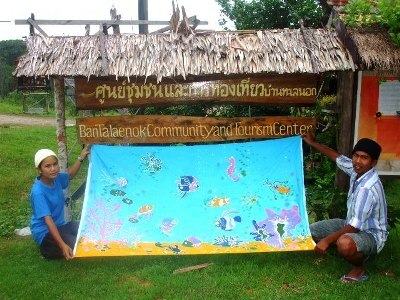 The youth of Ban Talae Nok are very much aware of the importance of their surrounding mangroves and natural resources. 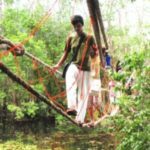 In cooperation with Andaman Discoveries and Mangrove Action Project, the village holds frequent camps and environmental education activities to encourage the children to think globally and act locally. The Youth Group pass on their informative messages with entertaining puppet shows. They have also travelled to other villages to tell other children why the world is worth saving and how everyone has a part to play. Pink is the all-star coordinator of the youth group, and over the last year has led the group in restoring a former shrimp pond, waste management and recycled art, and hosted an international seminar with youth from six other countries. Environmental Camps in 2008 and 2009 took place at nearby national parks, and included bird watching, species identification, visiting a sea turtle hatchery, and creating a transect map of natural resources around their community. Techniques involved the measuring and observation of their surrounding environment, data plotting and presentation of outcomes. 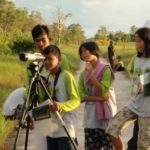 At a third camp, twenty students from Kuraburi and Ban Triam Schools participated in mangrove conservation efforts and exchanged ideas for future cooperation. The youth from Ban Talae Nok also took study trips to visit youth groups in Krabi and Koh Yao Noi. Andaman Discoveries has provided long term support for improved waste management in various villages since 2007. In particular, Ban Talae Nok now has a trash bin for every home as well as in public areas. 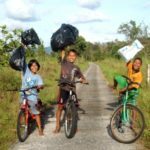 After a series of campaigns and lobbying, the local government now makes weekly trips to collect the trash, and a recycler goes to the village to buy recyclable waste. 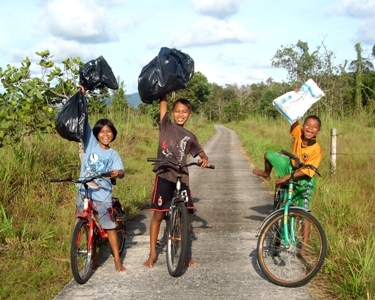 With environmental education, more and more villagers get into the habit of collecting and separating recyclables. The Ban Talae Nok Youth group has been encouraging younger members to Reduce, Recycle, and Reuse with the help of their fun and informative puppet shows. The group regularly collects the garbage in the village and on the beach. With donation from the Hannan Family, who visited in June, 2009, the group works to ensure that the village and the beach area are clean. The donation supports the purchase of snacks and drinks after the weekly cleanup. To provide supplementary income to those affected by the tsunami in the North Andaman area, Andaman Discoveries provided training and marketing assistance to handicraft groups in a number of villages. Handicrafts include: soap, batik, tie dye, and handmade cards from recycled paper. 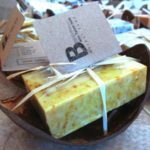 Andaman Discoveries supports these groups through interactive soap and batik making workshops and a local craft sales display in our office. 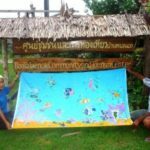 The Ban Talae Nok youth group is now producing recycled paper cards, a project Andaman Discoveries has supported since the tsunami through training and marketing. Andaman Discoveries supplies waste office paper, which the group uses to make greeting cards. In addition, “Pink,” the youth group leader, was inspired to make bags from recycled materials such as used paper, plastic, and scrap cloth. The group is currently refining their process and design, and plan to start selling these products as guest souvenirs and through the Andaman Discoveries gift shop and online store in 2010. 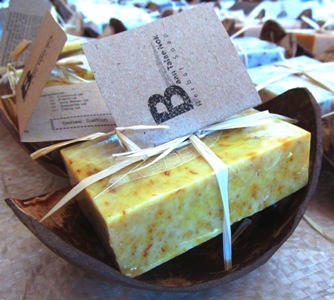 The Ban Talae Nok soap cooperative is making substantial progress in domestic marketing, garnering increasing interest from hotels and crafts shops in Bangkok, Khao Lak, and Phuket. The village of Tung Nang Dam is blessed with a pristine eight-kilometer beach front. Sea turtles and the highly endangered dugong have been sighted just off the shore. In addition to the scenic beauty and rare species, the beach area is utilized by villagers for fishing and community based tourism. In recent years developers have settled the land adjacent to the beach, with plans to build resorts and bungalows. In Thailand, regulations prohibit construction of any private structures within 12 meters of the high-tide line. Despite this law, it is common for developers to build right up to the shoreline, restricting local access to the land they have always relied on. In 2007, two local women and our ACE program graduates, Chim and Noi, attempted to petition to different stakeholders, including villagers, landowners, government officials, to protect the beach area by building a trail next to the boundary line between the public and private land. Andaman Discoveries’s predecessor, North Andaman Tsunami Relief, supported their conservation efforts by providing a stipend to them for their outreach work. Andaman Discoveries encourages organic gardening to promote local self-sufficiency and good health by reducing the purchase of groceries. Mangrove Action Project and International Union for Conservation of Nature supported and trained Ban Talae Nok youth in organic gardening techniques. The result is six garden plots where vegetables such as lemon grass, long beans, chilies, galanga, eggplants, and morning glory are locally grown. Approximately 20 houses have been given seedlings to grow fresh vegetables, with the goal of even more villagers growing their own food. Andaman Discoveries will provide continuous support by developing organic gardening into a regular village tour activity. Community groups lack resources to access each others’ knowledge and learn from already successful examples. To address this, we have helped over 300 participants from ten community groups to visit each others’ villages and share their history, management, strengths, and weaknesses. Accompanying skills workshops demonstrate sustainable tourism activities such as mangrove and forest tours, volunteer activities, and homestay inspections. Guide Training – Twenty-two participants from nine communities learned the basic concepts of guiding, showcasing village attractions, and practicing the “safety, meaning, and service” (SMS) philosophy. Discussions and role play activities allowed experienced guides to share their knowledge with beginners. Group Management – Nineteen people from six N-ACT villages took part in a training to learn management and organizational approaches to maximize benefits of tourism to the community and its natural resources; and to help define the current status of tourism in their village. Andaman Discoveries has sponsored learning tours to “best-practice” examples of sustainable development to understand how communities outside of the project area develop, organize, and manage sustainable agriculture, cultural empowerment, and alternative livelihoods. Through-out these activities, participants learn the fundamentals of community-based development, including: stable livelihoods, stewardship of natural resources; and the “community participatory approach” to making sure that efforts succeed in the long run. An informal atmosphere generates a learning environment based on interest instead of academic pursuit, with community members leading most of the discussion. Koh Lon (Phuket) – administrative, hospitality, and financial management; demands and challenges of access to a large tourism market. In 2009, the youth group of Ban Talae Nok enlivened the village environment by building a “green path” along the main road that had no trees previously. Locally grown plants such as Pak Leing, a local vegetable, rose apple and mango trees have been planted on both sides of the road. This project was supported by Andaman Discoveries financially in 2009. 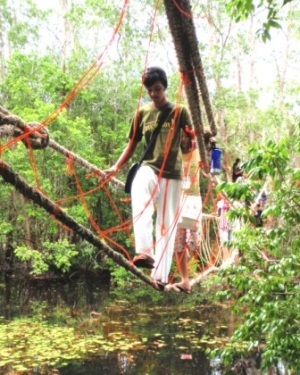 Andaman Discoveries worked in partnership with the Birmingham University International Volunteering Society (UK) in August 2008 to provide a safe access to Samakeetham Temple in Tung Rak. Khun Likid, a local villager, said that “the community thought this would be a worthwhile activity for the volunteers and a great way for them to learn first hand about Buddhism.” The nine volunteers spent three days to help with sand moving, bricklaying, cement mixing, paving and planting to construct the path. 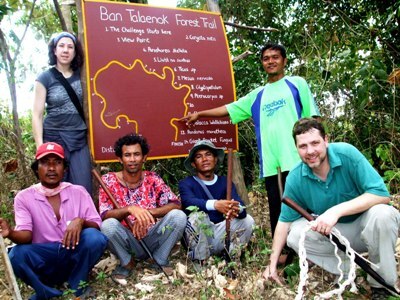 Andaman Discoveries sponsored the construction of nature trails in the villages of Ban Talae Nok and Tung Nang Dam in 2007. Tourists and other guests can explore the forest around the villages while learning about the unique aspects of the jungle. In both villages, the trail development utilized local labor and knowledge, building a sense of pride within the community. They also have a conservation value, as they provide an income from the forest that does not involve hunting wildlife or removing plants. In Tung Nang Dam, the villagers identified several species of orchids and discovered a couple of new viewpoints during site survey. In Ban Talae Nok, signs and information have been posted along the way so that tourists can learn about the plant and wildlife that thrives on the hills. Both trails have been popular for tourists of all ages. 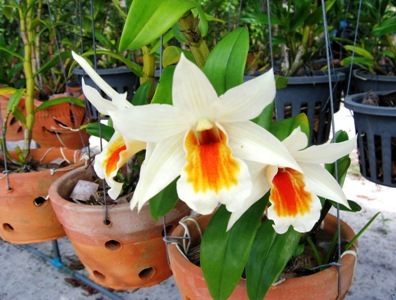 Orchids are popular decorations for homes and restaurants, and are becoming an increasingly rare sight in the jungle as a result of over-harvesting. Noi, a former Andaman discoveries vocational student from Tung Nang Dam, has started a project aimed at restoring the orchid population. The process involves transplanting cuttings from orchid stalks and incubating them in a community nursery; once mature, the seedlings are returned to the forest. The villagers are now educating others about the importance of conservation. 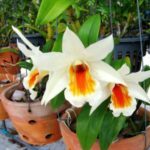 The Orchid Conservation project is an excellent example of community-led conservation and shows what’s possible with a small start-up fund and plenty of encouragement. This is a highly enjoyable volunteer activity, popular with people of all ages. In January of 2010, several members of the Andaman Discoveries joined with community members to spend an afternoon planting endemic water lilies as part of an effort to restore them to their native habitat. Nakha boasts stunning mountainous scenery, and is home to the highly endangered Water Lily, known locally as the “Yah Chong.” This fresh-water plant has unusually long leaves and delicate white flowers that bloom from October to December. Unfortunately, the water lily faces serious threats from river dredging and collection for resale as aquarium plants. In 2008, Andaman Discoveries worked with students from the Institute of the Environment of UCLA and the Naka Youth Conservation Group to collect water samples from five different areas of the Naka stream and record the stream’s depth, width and temperature. “Both us and the youth group seemed very excited to meet each other and as we started to step out into our individual ecosystem groups, I couldn’t help but notice that most of the youth were females. After learning a lot about gender issues in Thailand, it’s very natural to see females doing more humanitarian work than males. I think it’s even more interesting see this kind of gender dynamic at such a young age.” said Jun, a student from UCLA. Andaman Discoveries, in cooperation with Reef Check International, hosted a Reef Education Program in four communities along the Andaman Coast in November 2007. Over 60 people of all ages participated in the workshops. The practical workshops were designed for those communities participating in tourism and those wanting to minimize the effects of their activities in the delicate marine ecosystem. Workshops addressed everything from environmentally-friendly reef practices for anchoring and snorkeling to issues of boat safety. “I’m a fisherman,” explained 39-year-old Somsak Madsaron, “I’ve spent my life above the sea not under the water, but if our reefs and fish are to have a future, it’s up to me to take care of the reef.” Panya Surbhead, a community-based tourism boat guide explained,” I have lived all my life with the sea, but tourists are different. It is my responsibility to make sure they are safe while they are in my care.” A set of boat stairs were donated to each community to make it easier tourists to get in and out of the boat. Many of our partner villages depend on nearby mangrove forests for food, shelter, and as a nursery for many of the fish they later catch on the open sea. As more and more outsiders start to fish in local waters, the mangroves are being depleted. The residents of Tung Dap have created a “no fishing” zone to protect the most sensitive part of the dense mangroves that surrounds their village. Responding to increased incidents of poaching in the conservation area, community members want to start weekly patrols and make larger signs so outsiders can clearly recognize the “no fishing” area. Village leaders are ready act, but lack the cash for necessary supplies — so they asked for our help. We are proudly using guest donations to pay for gas for the patrol boat (a total of 20 trips over five months in 2010), and sign-making supplies. Background – There were about 74 homes in the village of Tung Dap on the island of Koh Phratong, the majority of which were completely destroyed by the tsunami. The destruction of the tsunami not only immediately affected the lives of people in Tung Dap by taking or injuring loved ones, but also deposited massive amounts of rubble in the mangrove forests. Villagers wanted to revive the mangrove forest for crab and fish populations to regenerate, so the villagers could regain their livelihood. The mangrove conservation effort in Tung Dap was led by community members. Village elders advised on which areas to set aside for conservation, and which species to plant in different locations, and village youth gathered the seedlings. Andaman Discoveries provided funding, technical assistance and advice on implementation in 2007. Since then, villagers continued to monitor the conservation area on a regular basis. Andaman Discoveries, in collaboration with Mangrove Action Project are assisting the youth group of Ban Talae Nok to restore mangrove forests on illegally encroached land. Planting nipa palm, which is commonly found in mangrove forests and is a durable natural roofing material, is a first step towards restoring the land through a natural process. The youth group uses transects to record biodiversity and physical information on the two plots to assess changes over time. The plotting activity is a learning process for the youth in appropriate methods of mangrove restoration. “We want this demonstration plot, to become another source of knowledge for the local people and also non local people,” said 12-year-old Jiraprapa Hahnjit. “It’s good to learn about the importance of the mangroves while having fun with friends,” explained another 12-year-old Sudarat Padungchat. Other youth conservation members expressed the importance of community service and understanding the mangroves for the benefit of the village. Andaman Discoveries supported mangrove rehabilitation in the North Andaman area. In 2008, we worked in partnership with the the Institute of the Environment of UCLA, the Birmingham University International Volunteering Society and the Rufford Small Grants Foundation. The students participated in the mangrove rehabilitation project in Had Phra Phad. Instead of using only one specie for habitat restoration, many different types of mangrove species are collected from the beach. This creates a mangrove eco-system that is more like nature and is more likely to survive. The students collected the seedlings on the beach, worked in the nursery and made a path and signs at the nursery. The Rufford Small Grants Foundation funded the mangrove rehabilitation project in Had Phra Phad for one year in 2008-9. 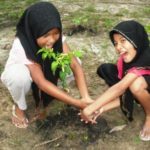 The goal was to improve knowledge of coastal communities through increasing awareness among the local villagers, which leads to the responsibility of a healthy mangrove ecosystem.